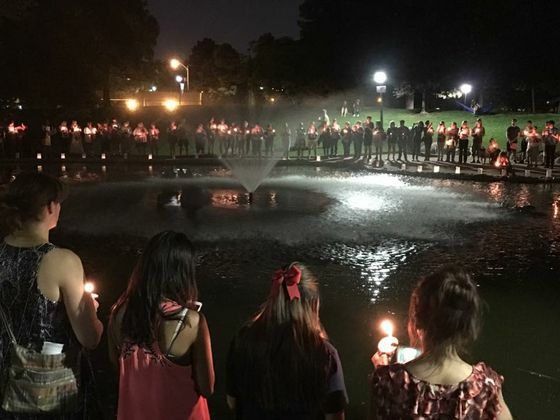 In an effort to provide support to the community as they work through their emotions surrounding the recent events in Orlando, The University of New Mexico’s LGBTQ Resource Center, the UNM Health Sciences Center (HSC), UNM-Hospitals and other UNM student groups organized a memorial and candlelight vigil to honor the victims of last week’s tragic events. More than a 100 students, staff, faculty and community members gathered at the Duck Pond to stand in solidarity with the LGBTQ community. Candles framed the pond as the names of the victims were read followed by a moment of silence. A statement provided by UNM President Robert Frank reinforced that The LGBTQ Resource Center, the Division of Equity and Inclusion, the Office of Equal Opportunity, and many other support groups and individuals on campus are dedicated to promoting diversity and acceptance as key values of our University. Speakers at the vigil included Alma Rosa, director of the LGBTQ Resource Center, Jozi De Leon, vice president for the Division of Equity and Inclusion, members of UNM HSC, and other local community groups and members. Community members gather at the Duck Pond to stand in solidarity with the LGBTQ community.